-Smart and competitive defender. Puts the effort in. Uses strength to advantage. Always gets a hand up on shooters. -Can't always gather himself for finishes off two legs when on the move. -Major question marks about how his interior game and rebounding ability will translate to the senior level. Outlook: Named to All-Tournament team after an extremely productive showing. Averaged 21 points, 14 rebounds, 5 assists and 2 steals per-40 minutes. Old school big man with a high skill-level, a great motor and an excellent basketball IQ. Already saw solid rotation minutes at a high level for Cedevita last season. Role will likely continue to grow this upcoming year. Will never wow scouts with his physical tools or upside, will need to win them over with his sheer productivity instead. Developing a consistent outside shot will be a major key in that. -Shows heavy feet on defense. Is he quick enough to guard power forwards? Is he big enough to defend centers? Outlook: Considered one of the top European prospects in the 1996 class. 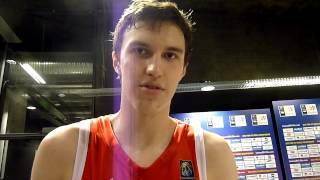 Son of Croatian national team 7-footer and Olympic silver medalist Franjo Arapovic. Appears to have been coached extremely well growing up, as he shows the maturity and fundamentals of a much older player. Does not show great athleticism at the moment, but is still in an early stage of his development physically.